Previous research confirms the effectiveness of home-education beyond a doubt: Parents and caretakers who choose home-education create an environment for the child, in which it can develop its abilities in both social and intellectual fields, regardless of the educational level or social position of the parents. Parents who choose home-education are capable of educating their children better than schools do, in cognitive as well as social areas. Home-education has proven to be a more than valuable form of education both cognitively and socially (Basham, 2001; Bester, 2002; Blok, 2002; Ray, 1997, 2004a; Rothermel, 2002; Rudner, 1999; Thomas, 1998; Wakelkamp, 1996). Home educated adolescent girls are more assertive, confident, and free-thinking compared to traditionally schooled girls, as confirmed by research conducted by Harvard University, among others (Sheffer, 1997). Sheffer (1) (1997) interviewed fifty-five home educated adolescent girls who learned at home and in the community. She found that these girls, unlike their peers in schools, were able to hold on to strengths they had as children and to resist challenges to their sense of self. Both English and American research shows that the gender-gap disappears with home education (Ray 1997, Rothermel 2002). For pupils attending regular school, the income or educational level of the parents serves as a reliable indicator of expected learning performance. It is very rare that students rise above their parents’ level (Dam & Vermunt, 2003). With home-education, on the other hand, children achieve a higher than average result, regardless of the educational level or social position of the parents. A parent’s education background has no substantive effect on their children’s’ homeschool academic performance, according to this study. Home educated students’ test scores remain between the 80th and 90th percentiles, whether their mothers have a college degree or did not complete high school. A long-term study in Great Britain also showed that working-class children who receive home-education scored better than school-going children of middle-class parents (Rothermel, 2002). It seems as if schools are less able to compensate for these differences, than are home-educating parents, and thus working-class children are, relatively speaking, better off when home-educated (Basham, 2001; Blok, 2002; Ray, 1997, 2004a; Rothermel, 2002). In nearly all American books about home education (March 2006, www.amazon.com 437 titles), (highly) giftedness gets a mention. For example, in the book Homeschooling the child with ADD (or other special needs), there were seven examples of (highly) gifted children with learning disabilities (Hayes, 2002, p. 42, 48, 60, 108, 134, 213). In books about home educated adults, there is a high percentage of (highly) gifted people. In Home-schoolers success-stories by Linda Dobson (2000), of the 15 adults, at least 8 persons were (highly) gifted. “…disturbing to consider how high a proportion of eminent people in history were home tutored” (p. 168). Only a few scientific articles have been written on home education specifically in combination with giftedness. Ensign (2000) wrote about the good results for home educated twice-exceptionals. Heinbokel (2004) wrote about home education and distant learning for gifted children, which also can be seen as a form of home education as long as the responsibility for the education rests with the parents and personalisation of the education is possible. Regularly, it has been researched why parents choose to home educate. Some of the reasons parents give could possibly be connected with (highly) giftedness.Fortune-Wood (2005, p. 28) ascertains that 44% of the families in their first year of home education, chose home education because of the bullying at school. (Highly) gifted children are (if there are no special measures done for them at school), even more emotionally vulnerable, due to their emotional intensity (Silverman, 2000, chapter 1), and therefore probably sooner a victim of bullying than the average child. The US Department of Education reported that in 1999, 11,6% of the home educators gave the following reasons for home educating: “school is not challenging enough for the child”; and 1,8% chose home education “because the child is not old enough to be allowed to start school” (Basham, 2001). Bester (2002) in Zuid-Afrika wrote that parents chose home education because they were not satisfied with the lower academic standards and negative socialisation that are present in schools. Meadows, Abel & Karenes (1992) reported in their research among 40 home educated children in the countryside of Mississippi, that 20% of the parents gave as the most important reason to home educate, “to meet the needs of a highly intelligent child” (p.15). In a not published research of 46 children with an IQ between 148-200+ (Kearney, 1991), 22% of the children were home educated. Surprisingly, it also showed that nearly half of the 46 children had been home educated sometime between kindergarten and university. With a closer look at the bell-curve of the English language test, one sees that of the six-year olds 70,5%, of the 8 year olds 20%, and of the 10 year olds 35,3% score the highest, contrary to the 3% of children nationally. As a contact-person for Levenderwijs (5), I talked mostly by phone with many parents, often the mother, who were considering home education. Out of all contacts with parents through the website Levenderwijs, about 50% of the concerns were regarding a (highly) gifted child (September 2003 until March 2005). If parents are not satisfied with the school education, they look for an appropriate alternative like home-education (Karnes & Marquardt, 2003). Access to the internet opens the door to all kinds of information and resources, and high-ability children can concentrate on a special subject, without being forced to stop every fifty minutes to go to another class, or limit themselves to the level of the textbooks or curricula (Gallagher, 2003). Home-education makes it possible to individualise the education for high-ability children. Home-education gives all highly and differently gifted children a chance to flourish in a way that is tuned to their unique needs (Rivero, 2002, p.182-184). The gifted child or youth can quickly become competent in the basics, and then accelerate – through instruction by special tutors or mentors – in any area of special giftedness or interest such as science, history, painting, geography, or instrumental music (Ray, 2004b, p. 12). Moreover, home-educated highly gifted children with learning disabilities (twice-exceptionals), are self-confident students, and although their academic skills may develop at uneven rates, they usually achieve academic proficiency by high school (Ensign, 2000, p.157). Considering the amount of literature, the (indirect) research results, the reasons why parents home educate, and the high test results achieved by home educated children; it is a reasonable conclusion that (highly) gifted children are being home educated. The participants were home educating parents at two annual home education gatherings: The Home Education Seaside Festival (Hesfes)(6) in England (n:81), and the North European Home Education Gathering in Sweden(n:23). 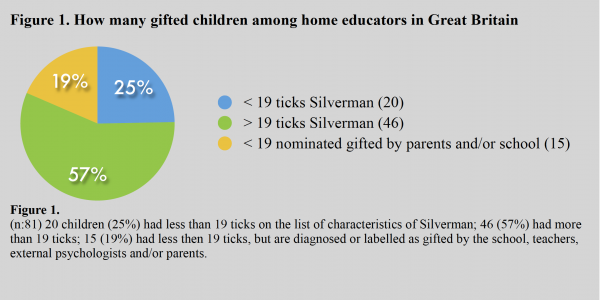 The questionnaire for the parents of home educated children (7) exists of a list of 25 characteristics of giftedness, developed by Linda Silverman. Many home educating parents don’t know if their children are gifted. Next, they answered some more questions. 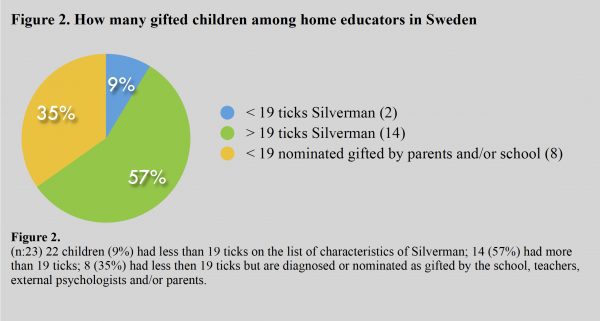 Less than 19 ticks on the list of Silverman were considered as not gifted, 19 and more as gifted. According to Silverman, parents are excellent identifiers of giftedness in their children: 84% of the children whose parents say that they fit 19 or more of the named characteristics score at least 120 IQ (the superior range). Over 95% show giftedness in at least one area, but are asynchronous in their development, and their weaknesses depress their IQ scores. In Great-Britain, 81 parents filled in the questionnaire about their home educated child between 6 and 17 years old. At the Hesfes were about 600 children in this age-group(8). Twenty children had less then 19 ticks on the list of Silverman (25% of the total). Forty-six children had more then 19 ticks (57%), and fifteen children had less then 19 ticks but diagnosed or labelled gifted, by school, teachers tests and/or parents (19%) (Figure 1). labelled gifted, by school, teachers tests and/or parents (35%) (Figure 2). Of the 40 gifted children at the Hesfes, 36 (90%) encountered problems at school. 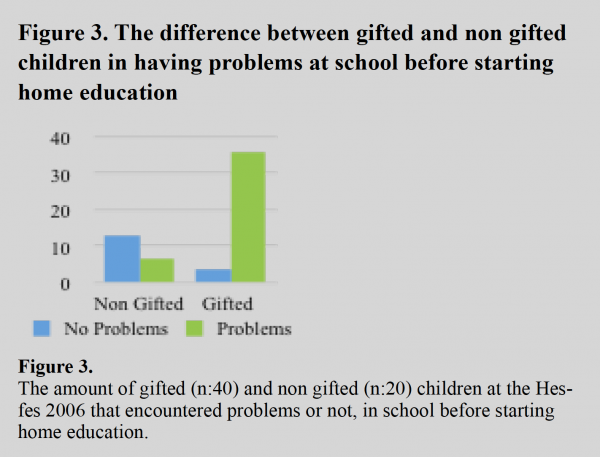 Of the 20 non gifted children, only 7 children (35%)encountered problems at school (Figure 3). The problems the gifted children encountered at school were many. Their educational needs were not met, they were (deeply) bored, bullied by classmates and also by teachers who couldn’t cope with their abilities and behaviour. Twice-exceptional children were misdiagnosed. In Great-Britain they also had problems with violence, behavioural problems, eating disorder, and one child even became suicidal. Four children encountered no problems at school (Figure 4 and 5). In Sweden one child had problems with social over-stimulation, and another child had problems because of the gender discrimination from the teacher (Figure 4 and 5). Most parents (35 out of 46) stated in one way or another that an advantage of home education is being able to personalise the learning. The children could finally take the time and get the support to complete work according to their own (high) standards, dig into subjects as deep as they like, and work in their own pace, and follow their own interests and strengths, without pressure to conform. Freedom to explore, discover, and learn in a relaxed happy environment. They can develop all their strong fields, and learn to cope with their weak points, like one parent put it. Freedom to excel and freedom from the constraints of school, wrote another parent (Figure 6). 16 out of 46 parents stated that encountered problems at school, like unhappiness, stress, boredom, non accepted, (disruptive) behaviour, non-co-operative attitude, eating disorder, being uninspired, being bullied, seemed to disappear, to resolve, or to become more manageable (Figure 6). Twelve parents stated that their children became happy again, were nicer to be around, became closer to the family and smiled again, and flourished. They were able to socialise with their intellectual peers. She is another child, as one parent put it (Figure 6). Eight parents mentioned that the self-confidence/self-esteem came back or improved after starting home education. He became happy and confident again (Figure 6). Among home educators, there seems to be an unexpectedly high percentage of gifted children. In Great- Britain, of the 81 children in the research (of a total presence of 600 children), 61 seemed to be gifted. This would calculate to 75% of the home educated children present at the Hesfes 2006. In Sweden 21 of the 23 children seemed to be gifted. This would mean even a higher percentage. 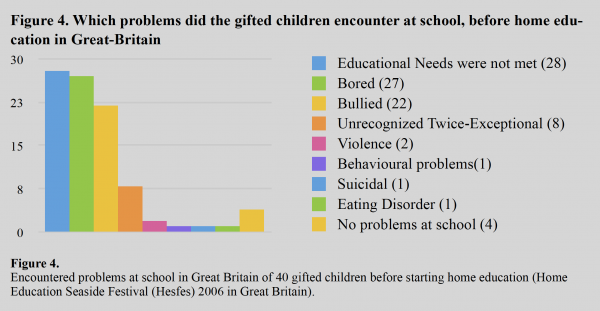 Of the gifted children in this research who have been to school, 90% have encountered serious problems in school: educational needs not met, boredom, bullying, unrecognised twice- exceptional, etc. – which disappeared or improved after starting home education. To the question “Did home education live up to the expectations you had before home education?”, 48 parents of gifted children of the total 61, stated “yes” in a very positive way: yes and tenfold more, far exceeded expectations (twice); totally, even more; 110%, of course!, etc. Six parents did not respond to this question, six had no expectations beforehand, and only one parent answered no. Home education occurs to be a very appropriate educational form for gifted children, which probably explains their over-representation among home educators. Are the problems that gifted children experience at school, school- or child-related? Why and how does home education work for gifted children? How come that home education, despite the good social and cognitive results for gifted children, is not readily available in all European countries? www.leverderwijs.nl A virtual organisation for home educators in the Netherlands. www.hesfes.org.uk According to the site, Hesfes is the the largest home education gathering in the world. 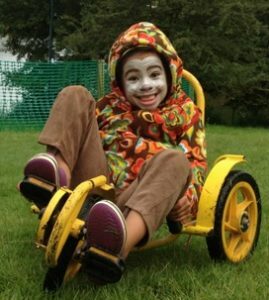 According to Andy Blewett, the founder and organiser of the Hesfes, there were about 600 children between 6-17 years, in 2006 at the Hesfes. In this 3.5 minutes three home educated young people answer the frequently asked question “what about qualifications” and share their very different stories. Their experiences help to show how qualifications – or the lack of them – does not have to be a barrier for a home educated young person going onto to college or university. Basham, P. (2001). Home Scholing: From the Extreme to the Mainstream. Toronto: The Fraser Institute. Bester, D. (2002). Die effek van tuisskoling op die sosiale ontwikkeling en akademiese prestasie van die pre-adolessent (The effect of home education on the social development and academic prestation of the pre-adolescent). Graduation thesis at the University of South-Africa. Ensign, J. (1997). Homeschooling Gifted Students: An introductory Guide for Parents. ERIC EC Digest #E543. Ensign, J. (2000). 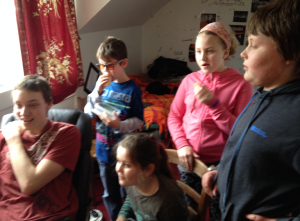 Defying the Stereotypes of Special Education: Home School Students. Peabody Journal of Education, The home Education Movement in Context, Practise, and Theory. Volume 75, number 1& 2, 2000. Fandard, J. & Nozarian, B. (2002). Etude sur l’instruction a la maison 2000-2002 (Research on home education 2000-2002). Clermont-Dessous : Les enfants D’abord, association pour la liberté d’instruction. Fortune-Wood, M. (2005). The face of home-based education 1: Who, why and how. Nottingham U.K.: Educational Heretics Press. Gallagher, (2003). Issues and challenges in the Education of Gifted Children (Chapter 2). In N. Colangelo & G. A. Davis (Eds) Handbook of Gifted Education (3rd ed.). Boston: Allyn and Bacon. Gardner, H. (2002). Too many choices? Review of S. Eaton, The other Boston busing story: What’swon and lost across the boundary line and M. Stevens, Kingdom of choice: Culture and controversy in the Home Schooling movement. New York Review of Books, 49, (6), 51-54. Heinbokel, A. (2004). Hausunterricht –Fernunterricht für Hochbegabte, aber nicht nur……. (Home education-Distant education for highly gifted, but not only) Published as appendix 4 in Den Informationen des Arbeitskreises. Karnes, F. A. & Marquardt, R. G. (2003) Gifted Education and Legal Issues: Procedures and Recent Decisions (Chapter 46). In N. Colangelo & G. A. Davis (Eds). Handbook of Gifted Education (3rd ed.). Boston: Allyn and Bacon. Meadows, S., Abel, T., & Kames, F. (1992). A study of homeschooling in rural Mississippi. Rural Educator, 13(3), 14-17. Pink, D. H.(2002). School is uit (School’s out). Ode, Inspiration for Change, 48. Ray, B. D. (1997). Strenghts of their own- Home schoolers across America: Academic achievement, family characteristics and longitudinal traits. Salem, OR: National Home Education Research Institute. Ray, B. D. & Rudner, L. M. (2001). Home Schooling Achievement. Purcerville: Home School Legal Defense Association. www.hslda.org/docs/study/comp2001/HomeSchoolAchievement.pdf Ray, B. D. (2004a). Home educated and now adults. Their community and civic involvement, views about homeschooling, and other traits. Oregon: NHERI-Publications. Rothermel, P. J. (2002). Home-Education: Aims, Practices and Outcomes. Working Draft. Presented at the BERA Annual Conference, Exeter, 2002. Silverman, L. K. (Ed)(2000). Counseling the Gifted and Talented. Denver: Love Publishing Company. Thomas, A. (1998). Educating children at home. London, New York: Continuum. Wakelkamp, A. H. N. (1996). Een ongehoorde keuze: Huisonderwijs als alternatief naast Schoolonderwijs (An unusual choice:Home education as alternative to school education). Afstudeerscriptie Hogeschool Arnhem Nijmegen. Walberg, H. J. & Williams, D. B. & Zeiser, S. (2003). Talent, Accomplishment, and Eminence (Chapter 27). In Colangelo, N. & Davis, G. A. edited by (2003). Handbook of Gifted Education (3rd ed.). Boston: Allyn and Bacon.